AIRDRIE, Alta.—There’s something slightly ironic about the fact that Don MacLeod was a 20-year old delivery truck driver when he first caught sight of another type of hauler – a 1960 Chevrolet El Camino. Half car, half truck, the El Camino was introduced on October 16, 1958. It wasn’t the first car-based truck in the North American market, however, as rival automaker Ford had begun selling its Ranchero model two years earlier. Car-truck hybrids have been around for almost as long as automobiles have been in production, with a few different early models appearing to be variations on the theme. However, it was the Australians who embraced the concept after Ford introduced the Coupe Utility at the behest of a letter-writer who needed a vehicle to carry them ‘to church on Sundays and the pigs to market on Mondays.’ The Ford Coupe Utility debuted in 1934, and the name was soon shortened to ‘ute’. Since then, utes have been a mainstay of Australian automobile production. The original El Camino was based on a Brookwood two-door station wagon platform. Outside, it wore the trim of GM’s top-of-the-line Bel Air. Inside, the seat and upholstery from a Biscayne were utilized. MacLeod finally stopped at the autobody shop and inquired about the El Camino. It was for sale, and almost 25 years to the day after Chevrolet’s introduction of the model, on October 29, 1983, MacLeod borrowed $400 from his girlfriend, added $200 of his own money, and bought the vehicle. MacLeod had big plans to redo the car with some body work and a few performance upgrades. He says he’d tinkered with a few cars prior to the El Camino, but body work wasn’t his specialty. The El Camino was delivered to a shop that specialized in collision work. They began the process of straightening out the car, but MacLeod wasn’t satisfied with the efforts. None of the body panels were lining up properly. He pulled the car out and sent it to another shop where, due to their high workload, it didn’t get finished, and MacLeod got the same result at a third body shop. While he’d painted the chassis and installed a new engine, the El Camino wasn’t anywhere near completion. The original El Camino was based on a Brookwood two-door station wagon platform. Outside, it wore the trim of GM’s top-of-the-line Bel Air. Don MacLeod of Airdrie spotted this 1960 Chevrolet El Camino outside of a body shop while he was driving a delivery truck for Westway Foods in Winnipeg. He bought the car in 1983 for $600. To the body, MacLeod fitted 1959 Cadillac taillights while the fuel filler door was shaved and moved to the inside of the box, which now features a wood floor. Don MacLeod looked after putting the chassis together on his 1960 El Camino, and installed a rebuilt 1969 Camaro engine. The upholstery package was purchased at Ciadella Classic Chevrolet Interiors in Tempe, Arizona. Barry Mills at Stampede Upholstery rebuilt the seat and installed the headliner, while the rest of the interior was fitted by Airdrie Rods and Restorations. After several years of fits and starts, this was the state of Don MacLeod’s 1960 Chevrolet El Camino as it sat on his nephew’s property in Manitoba. 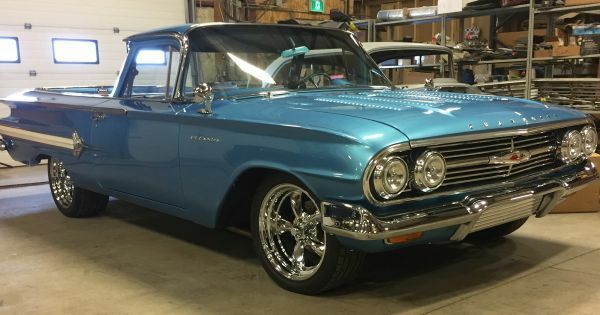 Finally getting the attention it deserved, Don MacLeod turned his 1960 El Camino over to Ronnie Smith of Custom Rides by Ronnie in Didsbury, Alberta. Smith cut and replaced many rusted out panels, including both rear quarters. Chevrolet built the first generation El Camino until 1960, when it quit production of the unique vehicle. But, the El Camino returned in 1964, when GM based it on the Chevelle platform. At that point, he simply parked the project car on his nephew’s pasture in Manitoba, where it sat while MacLeod moved first to Thunder Bay, Ontario and then to Cold Lake, Alberta for work. “I was throwing good money after bad, and while the car had been sitting, water got in the engine block, froze, and cracked it,” MacLeod explains. It wasn’t until MacLeod moved to Airdrie that he finally brought the El Camino home. He enlisted the help of Ronnie Smith of Custom Rides by Ronnie in Didsbury to complete the metal work. And, there was a lot of it. The El Camino needed new floors, new quarter panels and all new metal in the subframe under the tailgate. Meanwhile, MacLeod tackled the chassis. He pulled the cracked engine and installed a rebuilt small-block Chevrolet power plant that was originally under the hood of a 1969 Camaro. Backing up the engine is a two-speed Power Glide transmission. Upgrades include power disc brakes, power steering and air conditioning. To the body, MacLeod fitted 1959 Cadillac taillights while the fuel filler door was shaved and moved to the inside of the box, which now features a wood floor. After seeing a 2005 Mini Cooper in Electric Blue, MacLeod had the El Camino sprayed that hue. An interior package came from Ciadella Classic Chevrolet Interiors in Tempe, Arizona. It’s a 1959 El Camino pattern, and MacLeod added the trim from an Impala to the door panels. Chevrolet built the first generation El Camino until 1960, when it quit production of the unique vehicle. But, the El Camino returned in 1964, when GM based it on the Chevelle platform. The car remained in the automaker’s lineup until 1987, when production was halted. Some 35 years after buying the El Camino, MacLeod finally finished his project late in 2018 and showed it off at the 2019 Calgary World of Wheels. It garnered recognition there, taking top honours in the Restomod category as well as the International Show Car Association’s Street Achievement award for Truck. April 17–21: Calgary International Auto and Truck Show at the BMO Centre, Stampede Park. See all of the newest cars and trucks Wed., 12 p.m. to 9:30 p.m., Thurs. to Sat. 10 a.m. to 9:30 p.m. and Sun., 10 a.m. to 6 p.m. All adult (18-plus) weekday (Wed. to Fri.) tickets are $12.50 while senior (65-plus) weekday tickets are $10. Weekend tickets are $15 adults, $12.50 seniors and $10 for students/youth any day of the show. Family of four pass is $40, weekday or weekend.